19+ Actionable Hours of Expertise That'll Teach You to Build & Launch Money-Making iOS Apps! 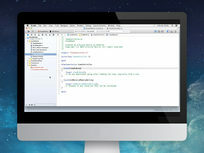 In this Objective-C programming training course, you will learn how to leverage the technologies that Objective-C, Xcode and Apple frameworks have to offer. You start the tutorial with a review of the Xcode interface, and how you are going to use it to build your Objective-C project. Throughout this video tutorial you will learn about using declared properties and instance variables, how to manage memory, create and work with classes, and how to use the debugger effectively, all of which help make your project a major success. This Learn To Build iOS Apps training course will teach you about the world of iPhone and iPad App development and how to use Xcode and Objective-C to create a functional iOS App. You will start with an introduction to iOS and SDK. The course then jumps right into teaching you to create your first functional Mobile App. As the lessons progress, you will cover topics such as: using the UIKit to build your interface, exploring the UITableView, implementing UIWebView navigation, and a number of advanced view controllers and features. This video tutorial also covers geolocation, working with the social features of iOS, and how to communicate with the Cloud. You will also work with the iOS Dev Center and learn how to submit your completed App to the iTunes App store. This tutorial teaches the absolute beginner how to build fully functional iOS apps for the iPhone and iPad. The course assumes you have no prior programming or iOS development experience, so you will be taught from square one and will build up your new skills to produce your own apps. You will get an introduction to Xcode and Objective-C, covering topics such as objects, classes, using frameworks and design patterns. Finally you will learn to prepare your app for distribution, including adding icons and launch images while also managing your apps in the App Store. This iOS Motion Framework training course teaches you about core motion framework, which allows your app to receive and process tilting and rotation data from your device. You will start by learning about the core motion framework and how to access motion data. Learning how to use the gyroscope and accelerometer is crucial for making your app move appropriately. Finally, this video tutorial will cover location and direction, such as using the compass, geocoding, and displaying the current location. All of which are necessary to the proper function of your awesome app. This iOS development course covers how to integrate In-App Purchasing into your application. This allows app developers to increase their earnings beyond the sale price of the app. You will start the course by learning how to set up your app in the Dev Center. Then start creating your purchase items in iTunes Connect, and implement the sale process in code to start earning extra revenue. This video tutorial will also explain and demonstrate the different purchasing options and shows you how to use iAds to generate even more money through your app. This iOS Media Library training course teaches you how to work with the various media options available in the iOS media library. You will start by learning about the image gallery in the media library. By learning to do tasks like taking, sharing and recording images, video and audio files, you will be able to navigate and fully work within the iOS media library. With working files included, you will be able to follow along with the author throughout the lessons to make sure you master everything that is the iOS Media Library. In this Location Services training course, you will learn how to develop iOS location services for the iPhone and iPad. You will start out by learning the different options for mapping locations and how to get the users current location. You will then learn about how to display a map that has zoom capabilities, set-up turn-by-turn directions, calculate the distance, and switch from road to satellite views. In-depth maps like these will give your app a more professional feel that can make all the difference when it comes to app sales. Finally, this video tutorial will teach you how to create simple and location based reminders so your users never miss a stop, turn or street. This iOS iCloud training course will teach you how to set up your app to use and work with iCloud. 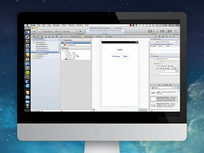 You will start by learning how to work with the local file system and the iOS archiving feature. Once you are familiar with this you will learn to work with directories and file management while also reading and writing iCloud files. Skills such as editing and renaming cloud files along with file synchronization are important to learning to master iCloud so you can get the best results for your apps. Integrating Social APIs can be a huge perk to your user base. Keeping your audience engaged adds some major benefits and with the rise of social media, integrating your app has become critical. You will start out by learning to use the UIActivityViewController and SLComposeViewController to post to Twitter or Facebook. This video training course will also teach you about the SLRequest API and allows you to follow along with the author as he teaches you about posting to Facebook, Twitter and reading the Twitter timeline. Finally, you will learn to work with the Facebook SDK, including how to set up, log in, post to the Facebook wall, and retrieve friends all through your application.